Happy Monday! I’m just popping in to share my thoughts on some recent items I ordered via Amazon Prime. I was recently accepted into the Amazon Influencer program which is an extension of their Amazon Associates program. Since I just started they gave me a $100 gift card as a part of the Influencer program. I ended up ordering more than $100 worth of items to try but most of it didn’t work out. A very cool feature of the program allows you to easily shop all of my Amazon product recommendations from a dedicated storefront and I make a small commission in return. I usually include notes with most products that I share to my shop so look for the little note icon on the top right corner. Update 8/9: Amazon increased my monthly gift card to $200 in August thanks to your overwhelming support of my recommendations in July! If there is anything fashion related that you would like me to review via Amazon Prime please let me know. I ordered this bag twilly hoping to dress up some of my bags and I like how it looks wrapped on the handle of this straw bag. There are a lot of YouTube tutorials about how to tie a bag twilly and it usually takes me about 3 tries if I take it off in order to put on another bag. The most difficult part is making sure that both ends are even. Over a week ago I shared my mail day via my first IGTV video. I wanted to try out this new feature on Instagram but I’m a beginner when it comes to compiling video clips since I managed to include one extra clip that I shouldn’t have. (Any guesses which one?) I also used iMove on my iPhone so I couldn’t figure out how to turn down the volume of the background music. For now I’ll stick to Instagram stories but if you have any longer form video requests (the app’s limit is 10 minutes) please let me know so I can get some ideas of what you’d like to see. The links to all products shown can be found at https://www.whatjesswore.com/p/igtv.html. 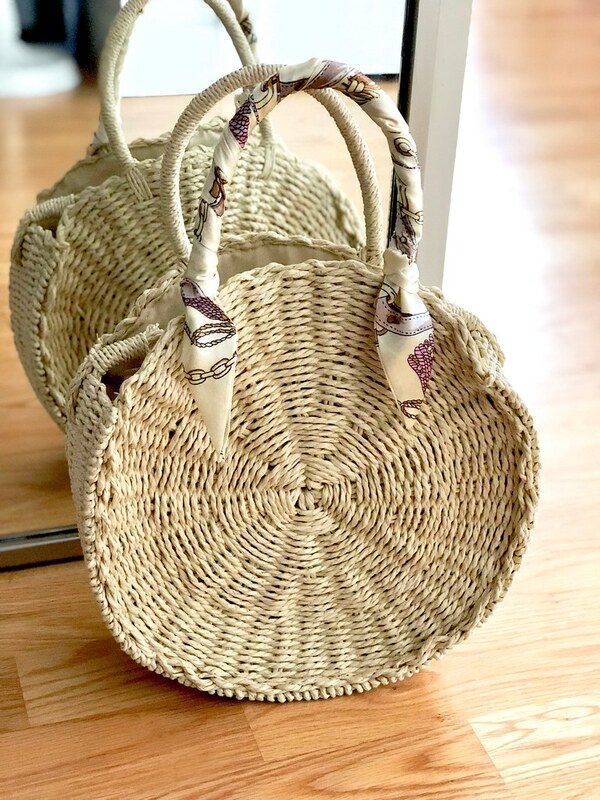 – Round Straw Bag – I don’t like the crossbody strap but you can tuck in the strap except it prevents you from fully zipping the bag. I was eyeing this darker color but I already have a Zara bag in that color (exact dupe here). I steamed the bag as they recommended which helps to reshape the bag. I used an oven mitt so I wouldn’t burn myself with the hot steam. Get the rest of my outfit details here. – Ainifeel Women’s Genuine Leather Hobo Shoulder Bag – Shown in blue grey and pink. The drop length of the pink color is a few inches shorter than the blue grey color. 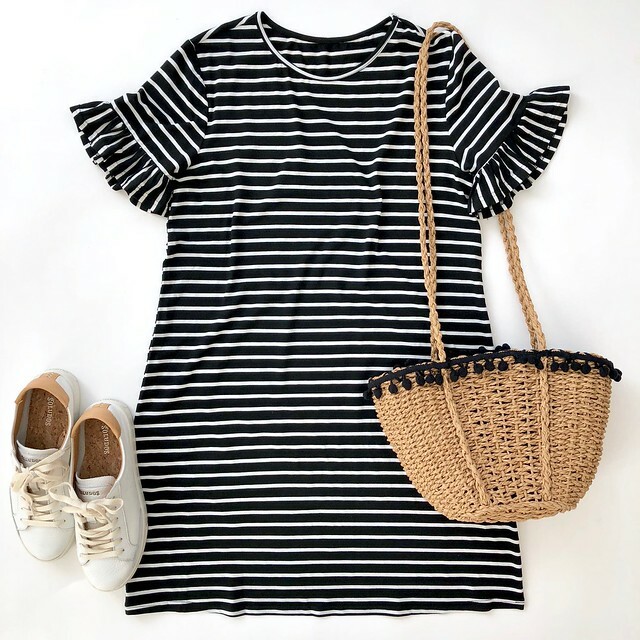 Out of this entire shopping haul I decided to keep the round straw bag, small purse insert and the striped t-shirt dress. 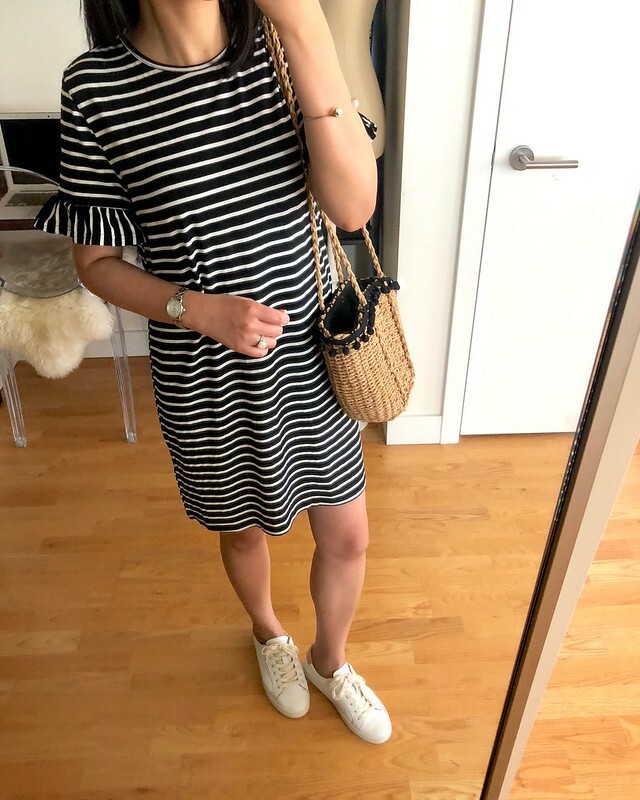 Update 8/6: In full disclosure, I regret keeping the striped dress since it’s a bit short and the material lends itself to looking wrinkly after washing. Today is Amazon Prime Day and the deals started at 3PM ET and ends tomorrow 7/17 at 2:59AM ET but to be honest I haven’t had a chance to check them out due to work. I noticed there was a deal for the 6 quart Instant Pot that I have for under $58.99 (I paid $99 last August). I love my Instant Pot for making soups but all the buttons scared me at first, it is very big and takes up precious space in our kitchen. Special thanks to Sandy for the heads up on this deal (more good deals in her Instagram stories today)! I love Amazon Prime and I enjoy Amazon Prime free shipping through my friend. She took advantage of Amazon Household which means that we both enjoy free Prime delivery benefits! I told my cousin about the ability to share Prime during Thanksgiving one year and he kindly shared his Prime delivery benefits with my sister when she mentioned that she didn’t have Prime. When sharing Prime each adult keeps his or her personal Amazon account while sharing the benefits at no additional cost. An Amazon Prime membership is $119 per year but if you’re willing to share your account then you could split the cost of the membership with other family members or friends! If you’re a student a Prime student membership is $59 a year and they’re offering a 6 month free trial. Amazon Prime is much more than just free shipping and you can read more about all of the amazing benefits here . I ordered some new dresses to try today because they had free shipping & free returns via Amazon Prime. I always look for items clearly labeled ‘prime & FREE returns’ to make sure the entire transaction is a breeze even if I change my mind. 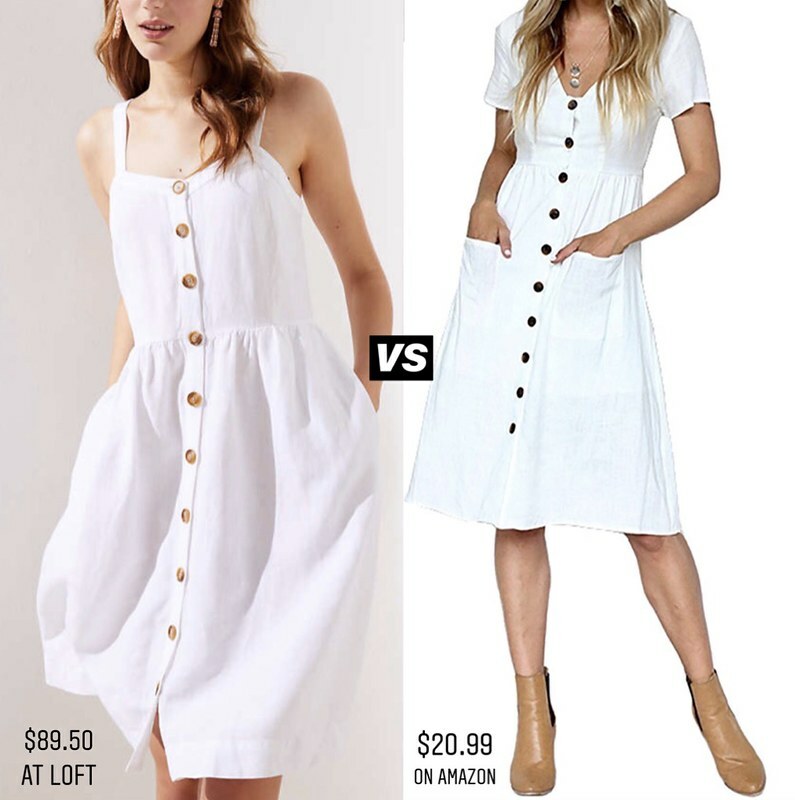 Update 7/18: I just wanted to quickly update that the Amazon dress on the right was too see through, I didn’t like the material and the sizing is meant to fit someone that is not petite (5’4″ and above). Size XS was too long and loose on me and it fit true to size. My entire dress haul was unsuccessful because the fit, sizing and/or length was not petite friendly (I’m 5′ 2.5″). The next LOFT everything sale should go live on Wednesday 7/18 according to a mailer I received last week. I have some fun try-ons that I did with my friend Sandy yesterday that I’m super excited to share so stay tuned! If you’re shopping the #nsale I will continue to update my previous post as the packages arrive but I may do an new blog post and/or Instagram stories.